In every household light is essential because it creates a pleasant environment, which is why the lighting is main part of the decoration because it depends on the comfort of the inhabitants of the house. For these reasons certain key aspects must be followed to obtain an aesthetic, practical and functional environment. To begin you must know what type of environment is the one that you want to illuminate; For example if it is a room in the house where you will be staying most of the time, or if it is an area that requires only a touch of indirect light. It should also be aware of energy consumption and for this there are different types of bulbs or lamps, namely, incandescent, halogen, fluorescent or low consumption. In the case of the kitchen and bathroom, one needs good lighting, as these are very popular for all rooms. You can opt for fluorescent lights, as these are economical and have a long life span, in addition to providing high quality light. Also interesting is the choice of halogen lamps, which emit a nice white light. In addition, the electrical installation of the house must be well planned, this must be done when it is a new house; it is necessary to give precise instructions to the electrician for the installation of the plugs and the wiring, it is important to have a good balance between home environments and lighting. The common areas like the corridor and the lobby are very good with indirect sidelights fixtures, i.e. mounted on the wall or with small and round bulbs in the ceiling, creating rooms with dim lights. Instead, in the bedrooms most people use incandescent lamps on the bedside tables. 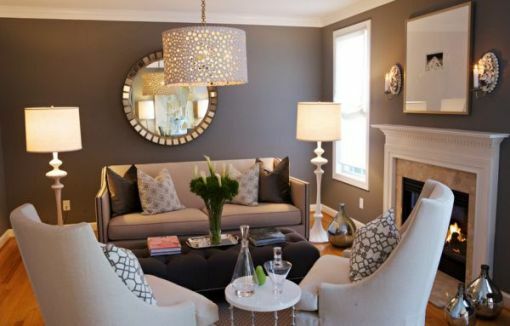 Also, it is very traditional and cozy to install a hanging lamp to illuminate the room in general. This same often happens in a study or living room, since traditionally a lamp is installed in the middle of the room, thus illuminates the room. In some of the corners can be placed a floor lamp with adjustable halogen to give an indirect illumination to the environment.